I am an earth scientist and I have been working continuously on the severe methane threat posed by the destabilization of the Arctic subsea methane hydrates for more than a decade. 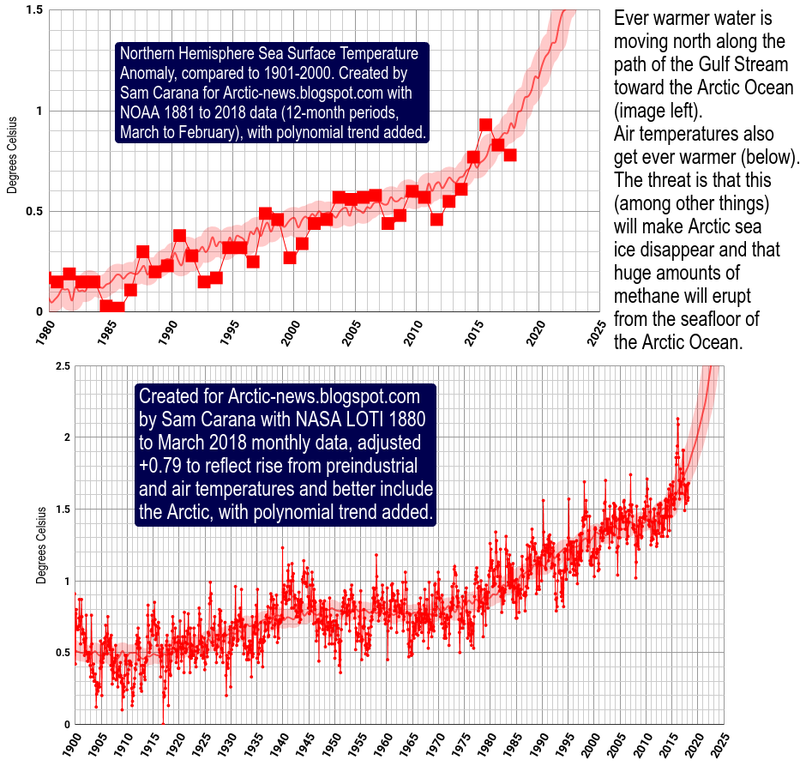 It is absolutely clear to me that methane is now being expelled into the Arctic atmosphere by the subsea methane hydrates at a fast increasing rate and that this expulsion began in earnest in August 2010. The methane is rising into the stratosphere and mesosphere where some of it is being oxidized to produce larger quantities of noctilucent clouds between 76 and 85 km altitude. These noctilucent clouds were seen north of Norway but are now occurring at much lower latitudes over Colorado. An early figure from NASA indicates that noctilucent clouds were originally confined to the southern polar regions (Figure 2). Prof. James Russel of Hampton University argues that the build up of methane in the atmosphere is the reason for the increase in noctilucent clouds. Prof Russel says: “When methane makes its way into the upper atmosphere it is oxidized by a complex series of reactions to form water vapor. This extra water vapor is then available to grow ice crystals for noctilucent clouds”. 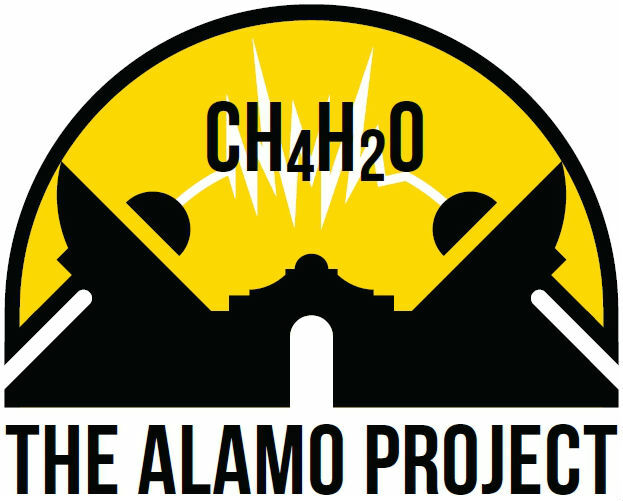 Therefore, if we succeed in breaking down the methane in the stratosphere and mesosphere using the HAARP - IRIS (Ionospheric Research Intrument) using the 13.56 MHz methane destruction frequency, it could lead to an increase in noctilucent cloud formation in a circular zone directly above the HAARP transmitters, which could be detected by optical cameras or radar. The HAARP tests should be conducted in the summer when the temperatures are at their lowest in Alaska (140 degrees to 160 degrees Kelvin) increasing the chances of noctilucent cloud formation from the radio frequency oxidised methane. 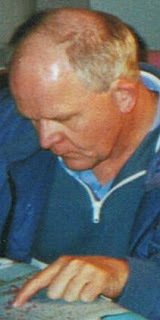 The HAARP IRIS transmitters normal frequency range is from 2.8 MHz to 10 MHz. 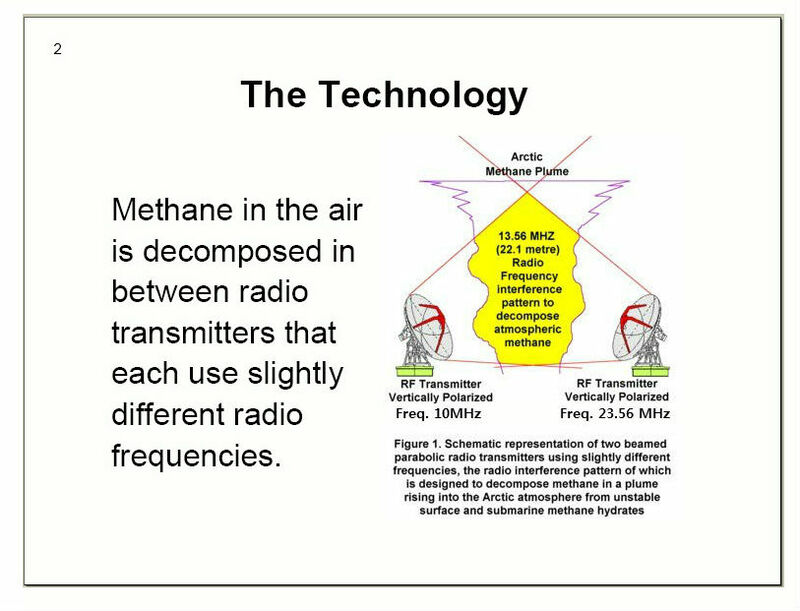 If for example a 10 MHz carrier wave is modulated by a 3.56 MHz signal, it will produce an Upper Side Frequency of 13.56 MHz, the required methane destruction frequency and a Lower Side Frequency of 6.44 MHz (Penguin Dictionary of Physics, 2000). NASA modelling shows a wide equatorial band of stratospheric methane reaching 1.8 ppmv, much higher than occurs in the troposphere indicating that the methane is rising up to the stratosphere where it is now accumulating and it will soon form a continuous global warming veil causing extreme heating of the Earth's surface by trapping the suns heat below it (Figure 3). Why decompose? Won't that add carbon dioxide? The problem is that the methane being released into the Arctic atmosphere from destabilization of the submarine methane hydrates has an extremely high global warming potential compared to carbon dioxide, close to 100 times for the first 15 years of its life. Hence a methane concentration of 2 ppmv is approximately equivalent to adding 200 ppmv of carbon dioxide to the atmosphere, i.e. multiplying the present carbon dioxide content by 1.5. But 2 ppmv is only 2 ten thousands of a percent of methane and you need about 15 percent of methane in the air for it to burn. Can't we just burn the methane? Therefore you cannot burn these giant clouds of methane erupting into the Arctic atmosphere and they are rising so fast through the troposphere into the stratosphere that they become impossible to deal with without some action at a distance method such as radio waves or laser. We could of course try to get chemicals up there and into the Arctic but that would lead to even more pollution in the long run. Vibrating the ionosphere at the correct methane destruction radio frequency using HAARP may help to oxidize some of the methane throughout the entire stratosphere and troposphere, but more localised radio/laser destruction of the rising methane clouds will be required if we are going to make any dent at all in the volume of methane that is now being released into the atmosphere from the Arctic ocean. Can't we get the methane out of the soil and use it as fuel? I have no doubt that ground penetrating radar and other electrical systems can release methane from terrestrial permafrost deposits and the conversion of methane to fuel oils was used long ago by the Germans in World War Two and further improved by SASOL in South Africa. However, we are dealing with oceanic methane being released in increasing quantities into the atmosphere from destabilised methane hydrates over which we have no control at all and once it is in the air and in the stratosphere we presently have no way to break it down. This Stratospheric methane reservoir is going to increase in density, thickness and extent until it encompasses the entire Earth and will eventually cause catastrophic global warming and the extinction of all life on earth. Furthermore because the methane remains mostly in the stratosphere, it is not recorded when average atmospheric compositions are determined at Mauna Loa and other locations, so we don't know how much is up there yet. When the German-French Merlin Lidar methane detecting satellite is launched in 2014 we should have a better idea of the methane distribution from the surface to 50 km altitude. When the Arctic ice cap melts towards the end of 2015, there will be a massive increase in the amount of heat being absorbed by the Arctic ocean from the sun and the Gulf Stream which presently feeds the Arctic with Atlantic water along the west side of Svalbard and through the Barents Sea. Normally, the Gulf Stream is cooled when it hits the floating ice pack and this will cease to happen bringing even vaster amounts of Atlantic heat via the Gulf Stream into the Arctic. 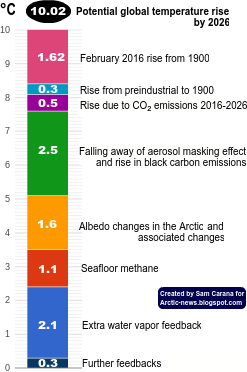 Consequently, the Arctic subsea methane hydrates will destabilize at an even faster rate, because of the increasing Arctic ocean temperature, pouring methane into the Arctic atmosphere and stratosphere. The extreme weather events in the United States this year which included record heating and drought conditions, massive loss of food crops with farmers going bankrupt, more hurricane flooding in New Orleans and tornadoes in New York is just a small sample of what will come in the next four or five summers as the Arctic ice finally melts. The Arctic ice cap works like the Earth's air conditioner, because of the latent heat of melting and freezing of the floating ice and its effect on atmospheric temperatures. The extensive stratospheric methane warming veil that is spreading over the United States is undoubtedly the reason for the extreme weather events and very high temperatures. The livelihoods of all the American people are going to be totally compromised in the next few years, unless we develop a system of destroying the atmospheric methane that is erupting in the Arctic from the destabilization of submarine methane hydrates and the methane that is accumulating as a global warming veil in the stratosphere and mesosphere. We are facing impossible odds with regard to the Arctic ocean methane release and in the same way that Colonel Travis drew a line at the Alamo to ask for volunteers to help him defend the mission against Santa Ana's massive Mexican army, I am drawing a virtual line through the snow on the top of the Arctic ice pack to ask for volunteers to defend the American people from the fast-gathering Arctic methane global firestorm. We desperately need dedicated scientists and engineers to volunteer to develop an effective 'action at a distance' method of destroying the Arctic oceanic methane clouds as they are erupting from the sea surface and entering the stratosphere and mesosphere. If the United States can land giant rovers on the mars with a skycrane, surely American engineers and scientists are up to this challenge. We need to get rid of as much of this atmospheric methane as we can, to drop the polar temperatures to reasonable levels. This will of course have to go hand in hand with a massive cut back in carbon dioxide emissions from all developed and developing countries. Facilities to decompose methane in the Arctic could be powered by hydrogen and fuel cells. The hydrogen could be produced at night by means of electrolysis using surplus energy from wind turbines offshore the coasts of the U.S., Europe and East Asia. Venus once had water, but runaway warming on Venus made the water evaporate. As water vapor is a greenhouse gas, this further trapped solar heat, causing the planet to heat up even more. So, more surface water evaporated, and eventually dissipated into space. In 2006, the Venus Express found hydrogen and oxygen ions escaping in a two to one ratio, meaning that water vapor in the atmosphere — the little that is left of what they believe were once oceans — is still disappearing. - amount of carbon dioxide in Venus athmosphere is HUGE. ~96.5% of Venus athmosphere is CO2! On Earth now, it's just 0.04% (400ppm). 2000+ times less! Nitrogen (N2), on the opposite, is only small part of Venus athmosphere (~3.5%), while 78% of Earth's athmosphere - is N2. CO2 is greenhouse gas, N2 is not. No matter what we do, we won't get our N2 replaced by CO2; Earth athmosphere is NOT Venus' athmosphere. It has to do with how planets form i guess. Venus was "carbonish" planet from the start, and still is; Earth was - and is, - "nitrogenish". I guess that's because different gases in Sun's protoplanet cloud were "layered" because of different atomic masses. Main negative feedback to warming on Earth is mightily powerful. It's heat emission from Earth to space. See, near-Earth space remains at same temperature: ~3K background of outer space (-270°C), plus whatever extra made by "space weather" - Sun's particles (which do not depend on warming of Earth, so it's costant). So, global warming on Earth increases the difference between temperature of nearby space and Earth surface/athmosphere. Larger temperature difference means more intensive heat transfer from hot body (Earth) to cold body (nearby space). Physics say that energy (heat) transfer is proportional to 4th power of temperature difference, so this is VERY powerful negative feedback. On Venus, it was overcame by combination of factors mentioned above, mainly (afaik). Much sulphuric acid forming clouds in Venus athmosphere is additional warming factor iirc. So, you see, Earth can get several degrees hotter - by loss of ice (and much albedo with it), by increase of CO2 and methane, etc; perhaps about 15...20 degrees hotter in worst case. But many dozens degrees hotter - it won't be. There is simply not enough radiative forcing to make our oceans boil, - we are too far from the Sun for this, and we do not have mainly-greenhouse-gas athmosphere to boil us up from within. Important to understand is that water vapor - strong GHG - cannot reach high concentrations in Earth air: at some point, it simply condenses into liquid water droplets, forms clouds (quite reflective things! ), and rainds/snows down. While 96.5% of Venus CO2 does not do this: CO2 has no liquid form in Venus conditions (nor in Earth conditions). But at least, Earth won't boil/fry literally, like Venus did. Surface temperature on Venus is ~462°C - enough to melt some metals. IIRC, it's higher than average Mercury's surface temperature, despite Mercury being MUCH closer to the Sun. So yes, Venus is really special place in terms of getting hot. Earth was held within temp range for life by what amounts to a symbiotic evolution with a progression of increasingly complex life systems to evolve an Oxygen rich Atmosphere and temps that could keep essentially the Sea alive. A pH of 8.23 typical to balance deposition of carbonate run off from land with deposition at Sea in geologic formation.. Once that is scrubbed from Earth things will resolve to a new balance point..
That can be averted perhaps with full out effort by mankind to stop heat up and to use the crisis upon us to transition civilization to sustain us. I'm not totally sure but I wouldn't doubt that effort would be appreciated a whole lot by a lot of people and who knows it may be just the thing needed to evolve in a fun way.. So generally spoken - Peace..
Peace is needed in the way people treat each other and toward Earth too. Well, we're working hard on ways to avoid that. Please do share Malcolm's call for help with others.